At first glance the new MMORPG Age of Wushu, currently in open beta and due to be released on the 10th of April, seems like yet another cookie-cutter Asian MMO game with eccentric English translations. Most of the press releases and news reports about the game emphasize the amazing “Kung Fu” motion capture combat moves of AoW but there is much more to this game than that. Age of Wushu is a great game that is innovative and fun. It’s still fairly new, of course, but it’s well worth playing because it has many sandbox elements such as the player-driven economy where most good items are player-crafted. The combat is quite different from that of other games so if you are bored of what you are playing right now, give AoW a chance and then please leave a comment on this post to let us know how it turned out for you. 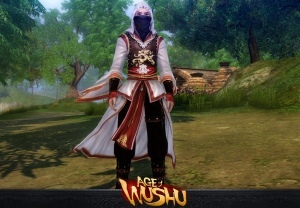 Here is an overview of what you can expect from Age of Wushu. Let’s talk about the combat first. The word “wushu” refers to Chinese martial arts. Snail Games, the Age of Wushu developers, worked with real martial arts experts and used their advanced motion capture technology to create the AoW skill sets. Combat uses a combat system in which players have to use their wits and time their moves according to the flow of the battle. There are three main moves: overt attacks, feints and parries. The three relate to each other in a Rock, Paper, Scissors way. Attacks beat feints, feint cuts through parries, parries defend against attacks. There are also flying moves (fun!) and special actions that use Chi or Rage. Only human characters are playable and there are no classes or levels. Characters gain experience and skills by doing any number of things but probably the most interesting activity is PvP and joining one of the 8 different martial arts schools. Players can gain experience quickly by doing a variety of tasks for their such as spying on other schools, killing spies of other schools, challenging and winning against a martial arts club, and joining the School Wars. Player vs player action is everywhere. All servers have open PvP. No safe spots exist. When you do offline your character remains in the game and gains experience. However, new players cannot PvP until they have reached a certain skill level. So newbies don’t get slaughtered when they log in. The school activities mentioned above are all PvP activities. Age of Wushu has a rather strict moral code. For example, those who join a particular school are forbidden from doing things such as drinking wine or beer, killing a player from the same school, not wearing proper clothes (being naked), kidnapping and stealing. Each time a player breaks the rules he or she will get School Disciplinary Points which are basically demerits. If the points reach a certain level the player will be unable to do anything but “repent” or, in other words, remain kneeling to ask for forgiveness. Ouch! Likewise, killing or kidnapping other players will give a character Infamy. If the Infamy reaches a very high level the character will be attacked by NPCs or even jailed for a time. The worst criminal who have a very bad reputation are publicly decapitated. Double ouch! Of course, there are many ways to get around this type of punishment. You can simply bribe the guards into letting you go, for one. Player guilds can own one or more castles and they must be defended by the guild members. The castles are linked to a specific area in the open world, not hosted in an instance. Guilds can declare war and the one in control of the castle can lose it if the other guild wins. Lastly, the best thing about Age of Wushu is that it has a player-controlled economy in which the best items such as food and gear are all player-crafted. Players can hunt for meat and hides, mine ores and gems, cut wood, farm crops, and fish. The raw materials gathered from these activities can then be made into weapons, armor, food, medicine, and other useful items. 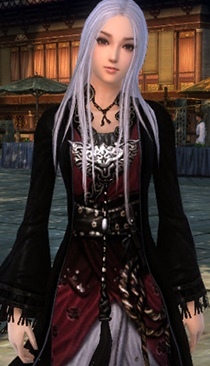 Age of Wushu shows a lot of promise and we suggest you give it a go if you are looking for a new MMORPG to play in 2013.